I'm a New Yorker at heart and I can have up to 2 bagels a day when I'm back in the city. Oh love. And I'd gladly join the queue at Katz's Delicatessen for their towering pastrami sandwiches. Obviously it depresses me so that Singapore doesn't do any of the above food items well. 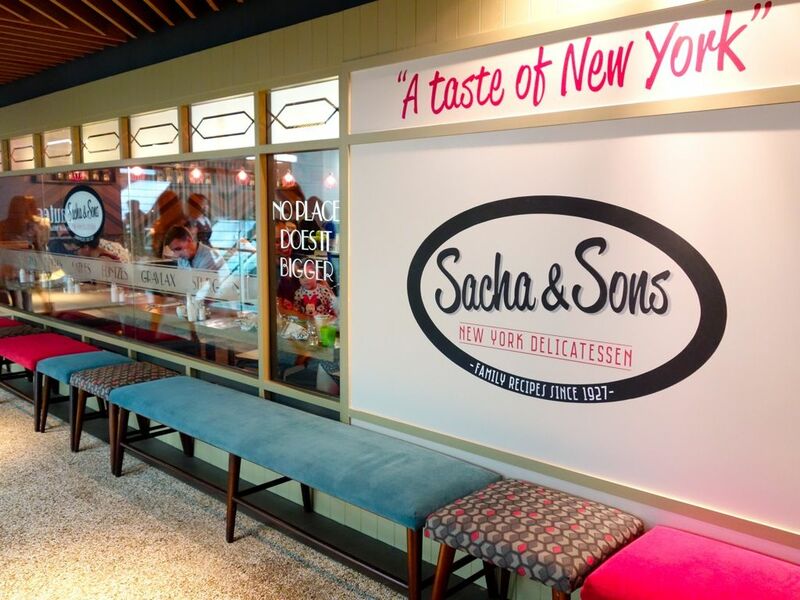 But that could change with Singapore's version of a NYC Jewish deli Sacha & Sons. 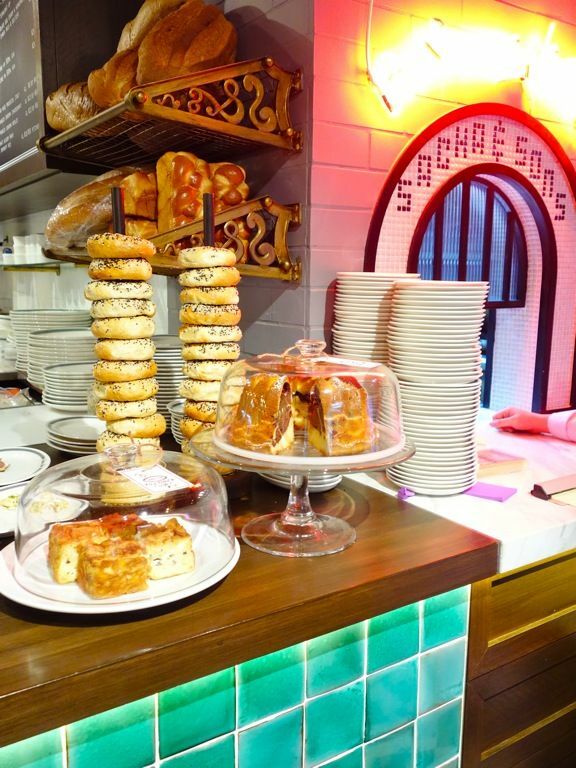 Located at the prime Mandarin Gallery spot which was previously Wild Honey, Sacha & Sons is a nice complement to the all day breakfast spot which moved next door. They are both opened by the same owners. 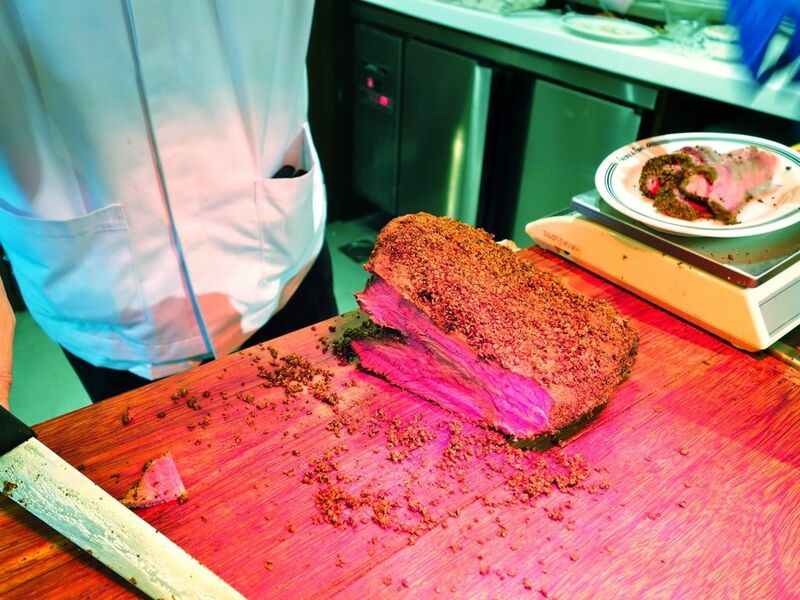 Expect meats like pastrami, corned beef, roast beef and smoked fish. 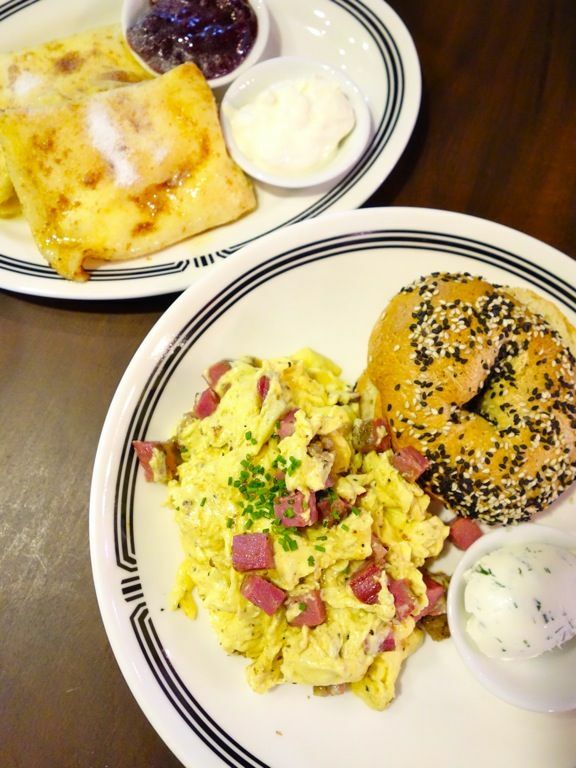 Cream cheese and pickles aside, Sacha & Sons offers other Jewish deli staples such as bagels ($3), latkes ($10-$16), chopped liver ($14), kugel ($7), and matzah ball soup ($12.50). I do enjoy liver e.g. foie gras and pate, but the version at Sacha was so metallic I had to wash it down immediately with water. Thankfully we had some smoked salmon and that got rid of the pungent aftertaste. We had a taste of the pastrami ($16, $24, $35), and immediately decided that whatever we ordered, there must be pastrami in it. The slices were sufficiently juicy when carved and salty enough to satisfy a savory craving. I was torn between a Reuben Sandwich ($16) and a bagel (there's no denying my love for bagels. Even though there is a Bagel Reuben option, i was adamant that only Rye bread goes with the juicy brisket. Yea yea I'm particular that way. 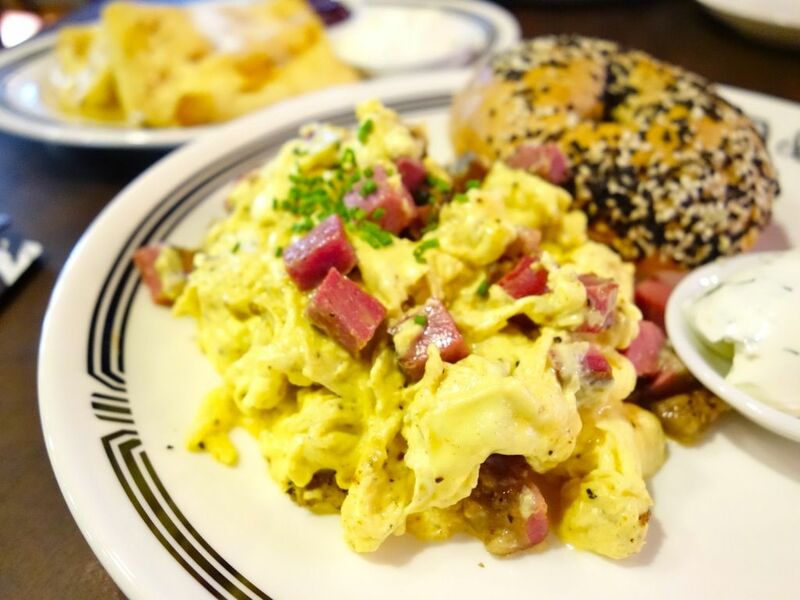 In the end, Z and I settled on the Scrambled eggs with pastrami and toasted bagel ($18). I'm glad to report that the bagels were satisfying. Exactly the kinda dense chewy dough with a shiny crust that I miss. However, I think the texture has been tweaked a little to cater to Singaporeans who can't take hard food (roll eyes). There are only sesame flavored bagels because they are more versatile for sandwiches I guess. Sigh. We had the herb cream cheese to go with and it was thick and rich in terms of flavor and texture. If you dislike garlic, you'd be put off by this one. It's so pungent that it can kill a vampire but it's oh so good and savory! 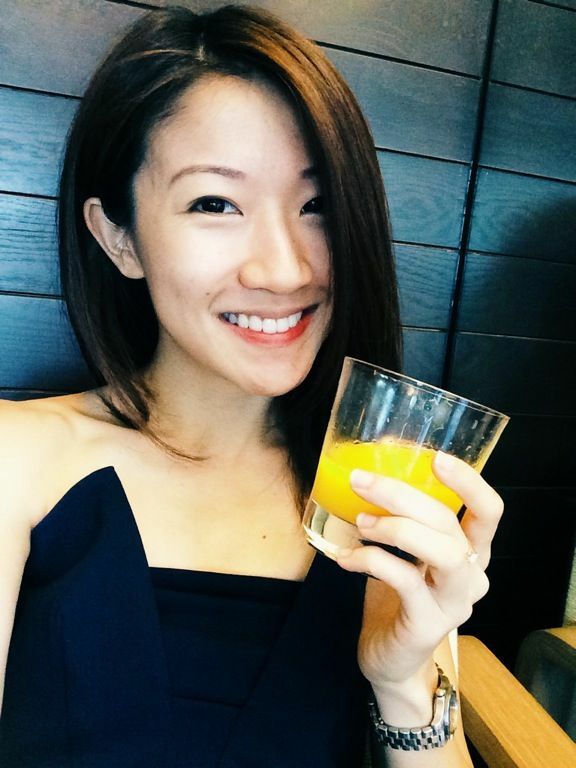 I haven't had a schmear so good in singapore. Go for the smoked salmon cream cheese (or lox cream cheese) if you want something saltier (it was very good). I hope they up their bagel game. We could certainly do with variety like say maple bacon walnut. We didn't know that the dish already comes with cream cheese so we added another side of that garlic herb ($3) for good measure. Turns out each portion was just about enough for a half of a bagel. Sacha & Sons was generous with the cheese but if you have tried a real bagel in NYC, you'd feel short changed. The scrambled eggs were sufficiently runny and had nice layers in them. They may resemble a chinese fried omelette a little. The pastrami was cubes and cooked with the egg and that resulted in a drier texture. What a pity. Would love to give the Reuben and traditional Latke (fried potato and onion cake) a shot next time but the bagel is gonna be my staple here. 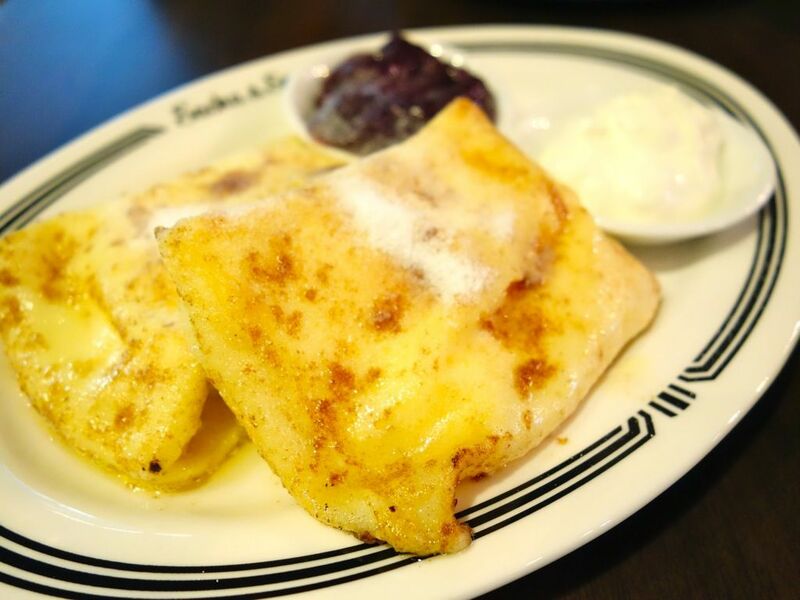 We had the Sweet blintzes ($12) which is a crêpe stuffed with cottage cheese, and paired with sour cream and jam. It reminded me of the waffles we had in Stavanger, Norway. That was my first time pairing sour cream with waffles and we were told it's a tradition. On its own, the crêpe was really oily, and the sight of it soaking in oil put me off the dish. Crepes and oil do not go well at all. It was soggy (with OIL) and bland. The sour cream and overly sweet jam could not take away that eeky mouth feel. I'd rather the Norwegian version with a light and crispy batter rather than wet mess. 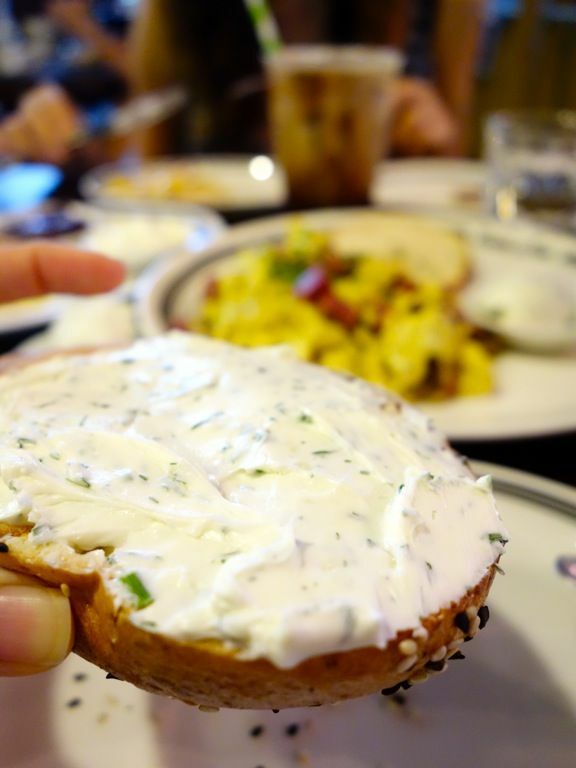 I'll head to Sacha & Sons if I have an NYC bagel craving, simply because my choices are limited in Singapore. At $8 for a bagel with lox cream cheese, they are certainly not marketed as a typical delicatessen. 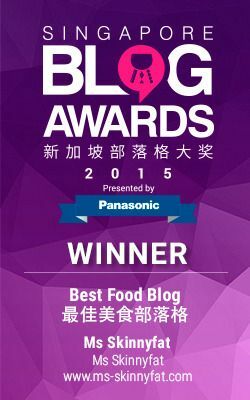 Well well, so much potential to cultivate a bagel culture in Singapore but not tapped on. Hopefully they stay around for a bit.